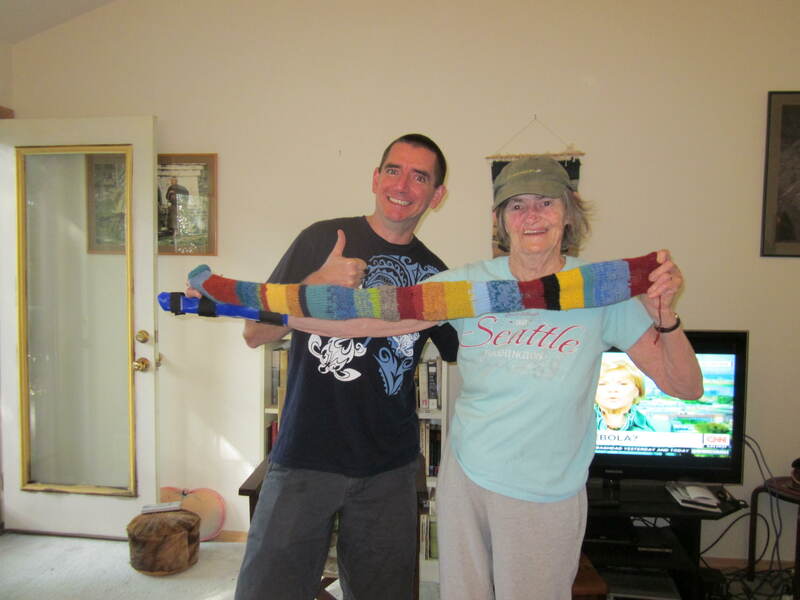 Here is the scarf. I have one loyal fan showing his approval. 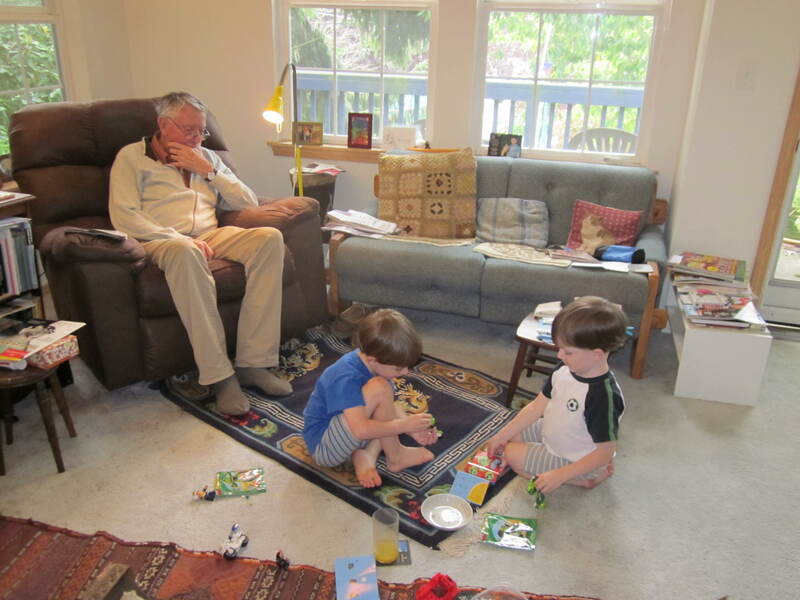 And his 2 sons played happily with their Lego dragon and frog , while Grandad looked on. 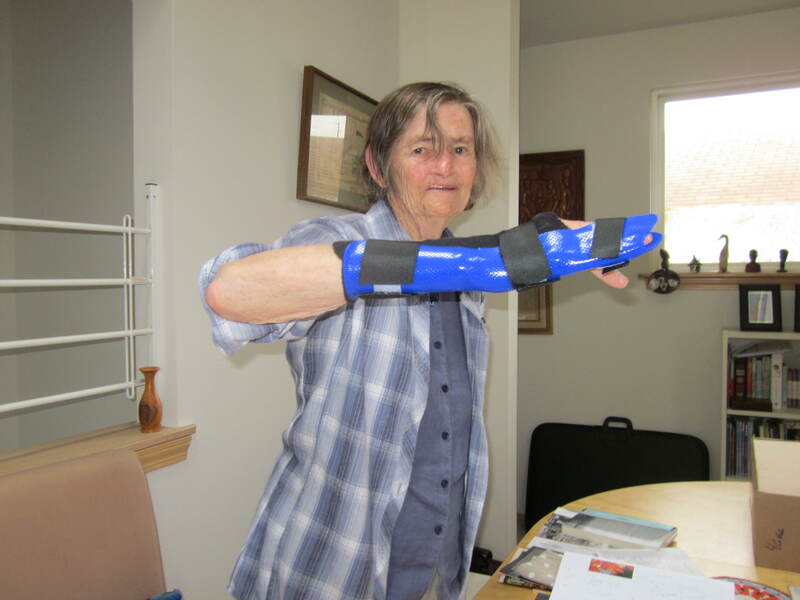 Here it is – my gorgeous blue splint which I am supposed to wear 24/7 for 6 weeks. The goal is to correct the little finger on my right hand. That finger insists on pointing down and I don’t have the strength in my knuckle to straighten it. Rather annoying but not painful. By attaching the little finger to the ring finger and keeping it there for 6 weeks I hope the tendon in the knuckle will shift into the right place. Now I have to figure out what I can and cannot do with this arrangement. I’m pretty certain I won’t be able to knit, and typing is rather slow. I posed the question a while ago about which books my parents and grandparents would have been reading. Now I’m going to raise the question with regard to knitting. 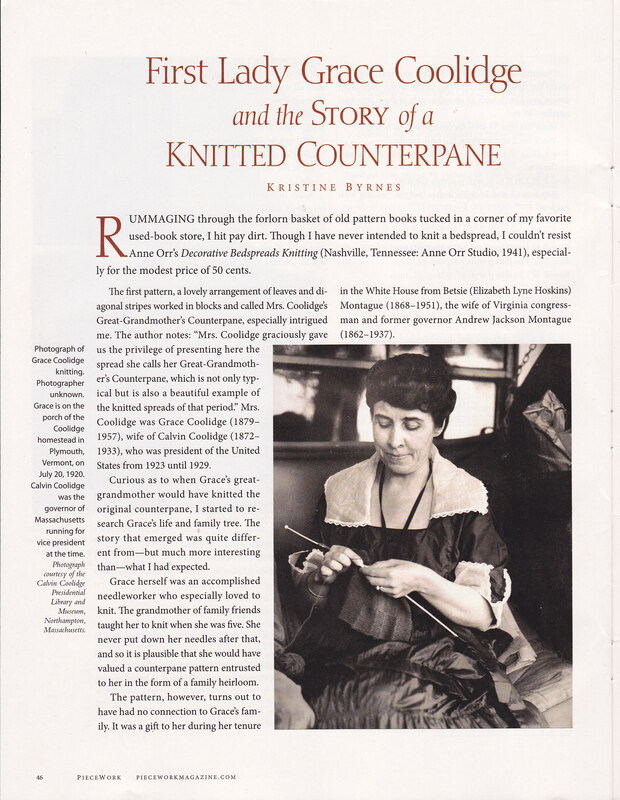 The current issue of Piecework Magazine is featuring historical knitting and there is an article entitled “First Lady Grace Coolidge and the Story of a Knitted Counterpane.” Now Grace Coolidge was the wife of Calvin Coolidge. Her dates are 1879-1957. Her husband, the 30th President of the United States was born in 1872 and died in 1933. He served as President from 1923-1929. Coolidge was a Republican lawyer from Vermont. When he was propelled into the White House upon the fatal heart attack of President Warren Harding, it was customary for the First Lady to remain very much in the background and to maintain her privacy. 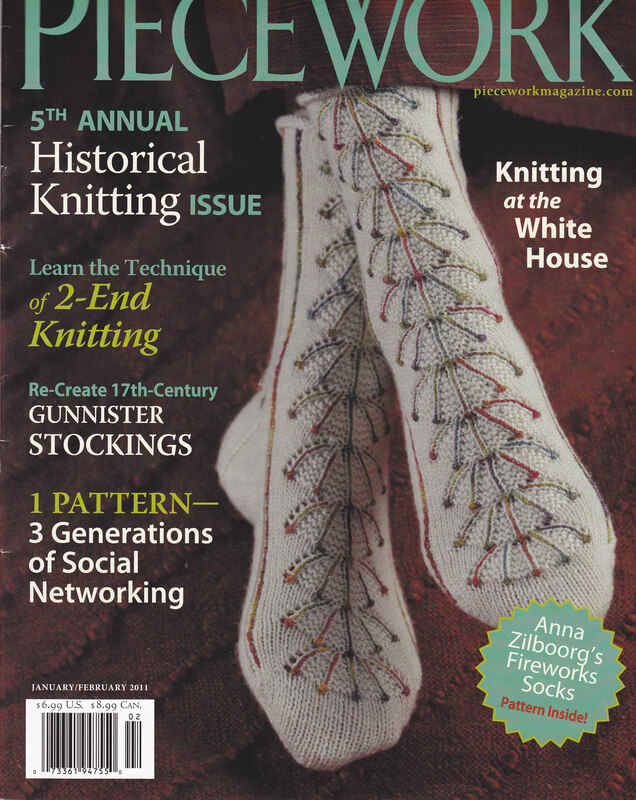 Grace Coolidge, the new First Lady, was an accomplished needlewoman who according to this article loved to knit. It is plausible that she would have valued a counterpane (bedspread) pattern entrusted to her as a family heirloom. The pattern was a gift to her during the time she was in the White House and is here called Grace Coolidge’s Great-Grandmother’s Counterpane. The pattern was part of a fund-raising effort for the Home for Needy Confederate Women in Richmond Virginia. So that takes us back to the era of the American Civil War. My grandparents were born in the early 1870’s, 1863, and 1836. So they span that Civil War time. And the pattern for the counterpane was knitted by Mrs. Calvin Coolidge when she was in the White House. The author of this article in the current issue of Piecework, found the pattern for Grace’s great-grandmother’s counterpane in a 1941 edition of a book entitled Decorative Bedspreads Knitting, published in Nashville Tennessee by the Anne Orr Studio in 1941. And the fact that Grace Coolidge knit this pattern is testimony to the revival of knitting in the U.S. in the 1920’s when there was a general feeling that the homey household arts of the Revolutionary era should be restored. So the question might be raised, did my grandmothers knit these huge coverlets? Or did they confine their knitting to smaller practical garments for their growing families. A further question might be raised as to how my paternal grandmother came to marry a man 30 years her senior. No internet partner searches back in those days, but my grandfather, living in Newark or Mt. Vernon Ohio, did advertise in the newspaper (what newspaper?) when he became a widower and needed a housekeeper for his 2 children. My grandmother, in Crown Point New York, persuaded her father that she wanted to take on this job. So she went West in the early 1880’s and became the housekeeper and in 1882 she married the man. I don’ t know what happened to those 2 children by the first marriage, and their descendants. But my paternal grandfather and grandmother proceeded to have 5 children, one of whom was of course my father, born in 1891. My father was in fact born in Peoria Florida where the grain business pursued by my grandfather had taken the family temporarily. My father grew up in Newark Ohio and his first wife hailed from there. Do you ever go to a function or an event and only think afterward of all the outfits you might have worn, instead of what you happened to throw on that morning? Well, that happened to me this past weekend. 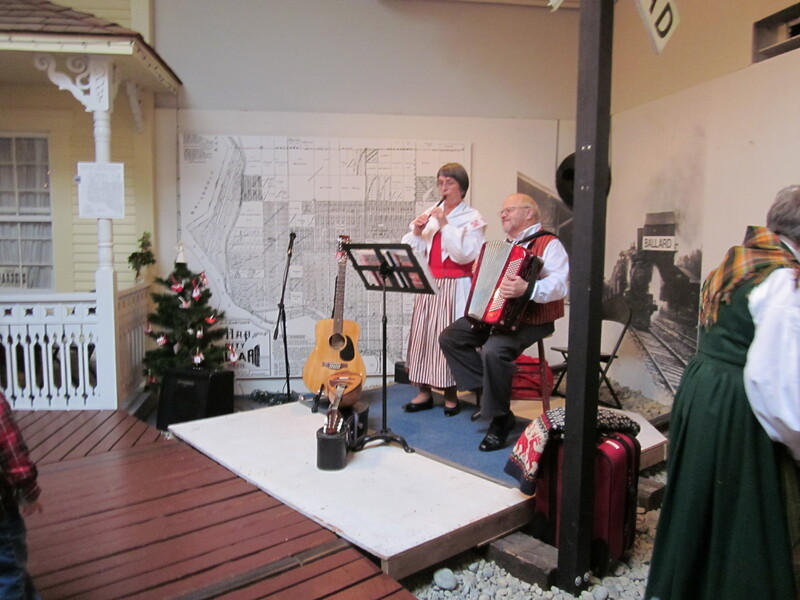 This was Yulefest at the Nordic Heritage Museum. 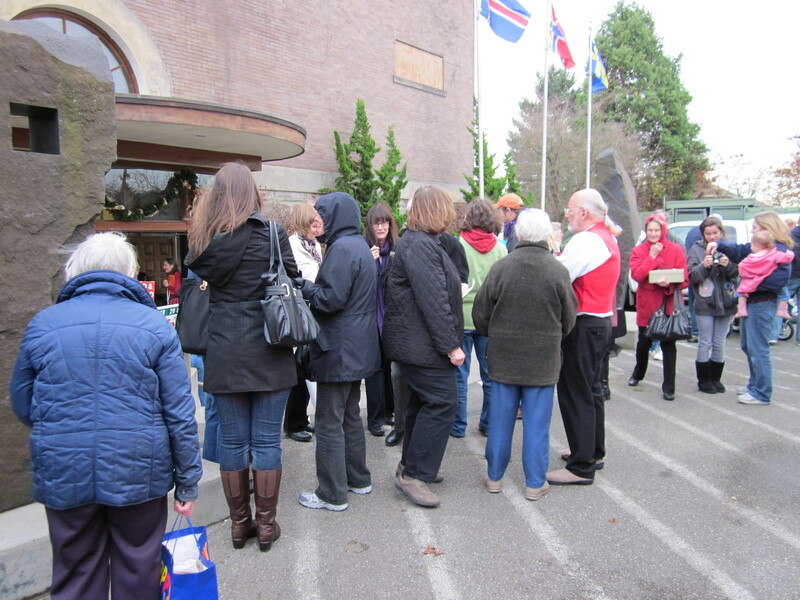 A wonderful event – Nordic handicrafts, food and music spread over 2 days. And a dazzling array of colourful sweaters was to be seen. 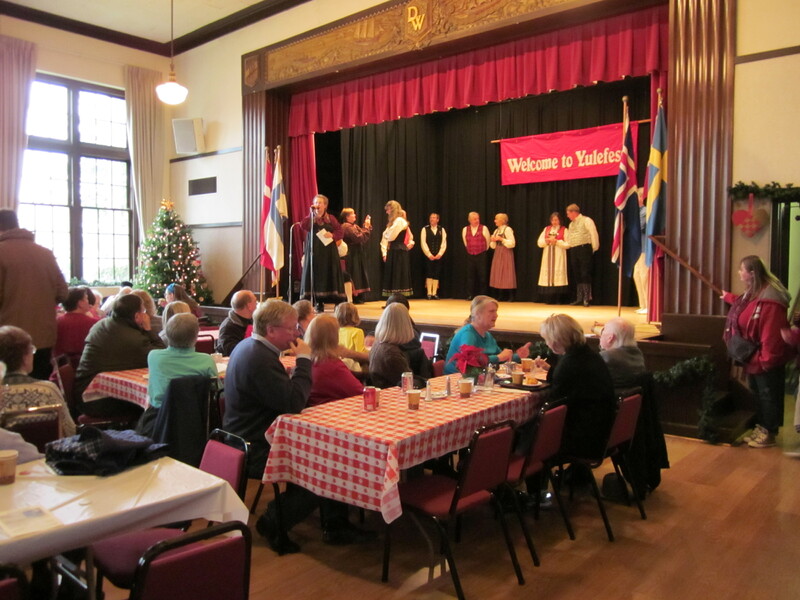 Plus many people in traditional dress as they demonstrated folk dancing and music from different parts of Scandinavia. And it was a cold weekend so what a great chance to wear one’s heavy sweaters. Yes, bitterly cold. I thought I was back in New England as the storm swept in. 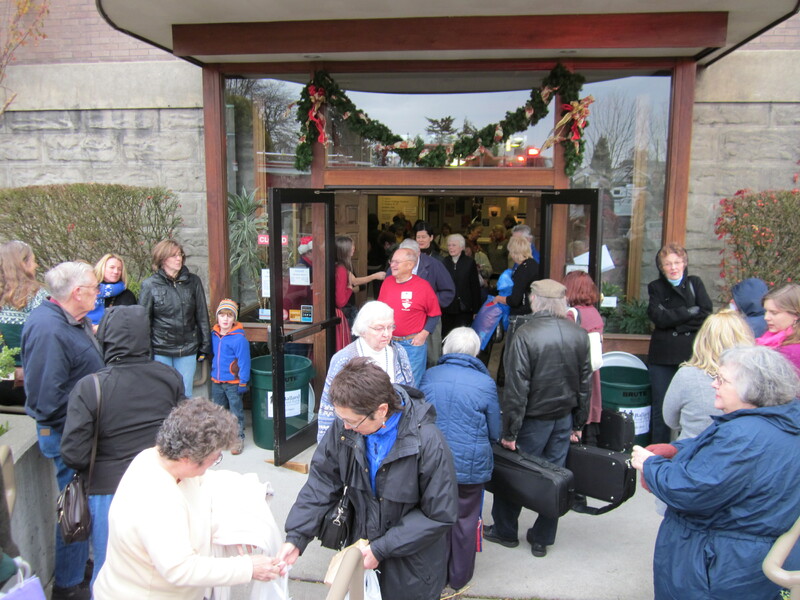 But before we even were able to enter the Museum, people were streaming out of the building because the fire alarm had just gone off. And then it happened again later, as it had happened even earlier – 3 times in all. 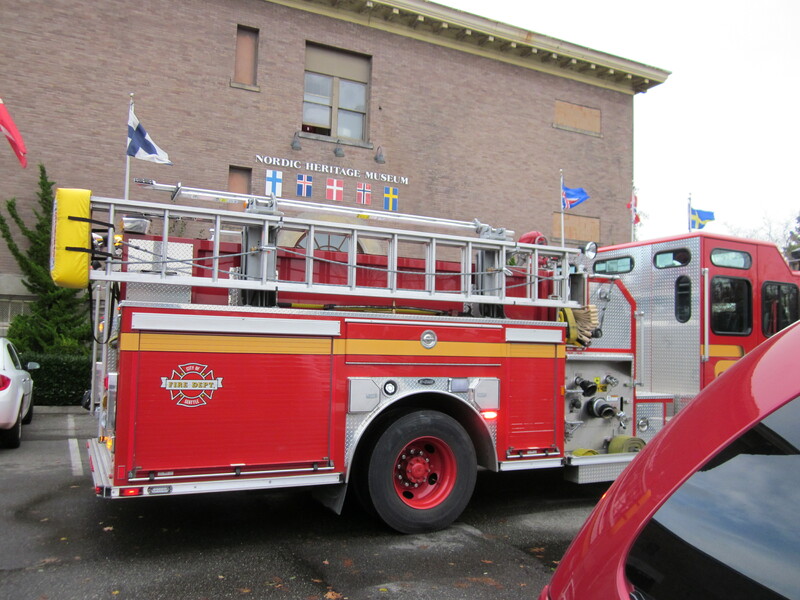 No actual fire which is just as well but maybe a fault in the system?? Those warm sweaters were very welcome protection against the cold. 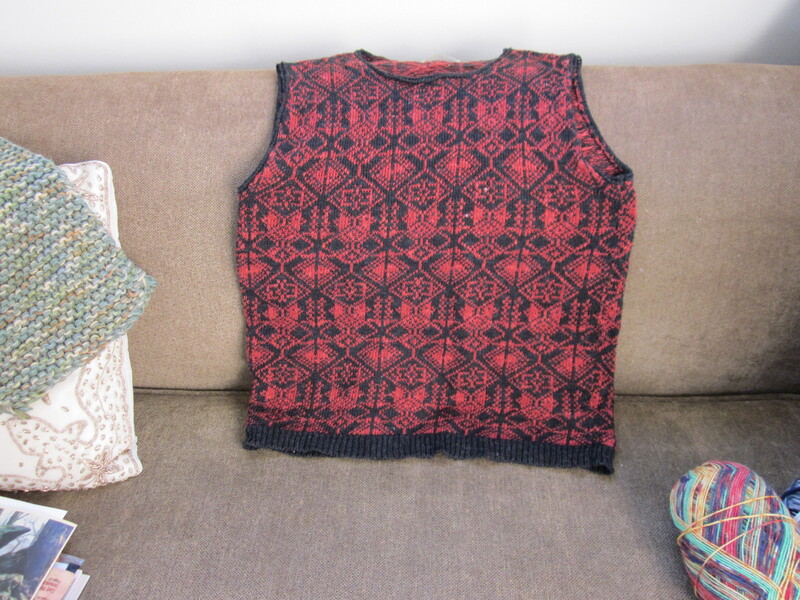 this is an image from Annemor Sundbo’s book Everyday Knitting. 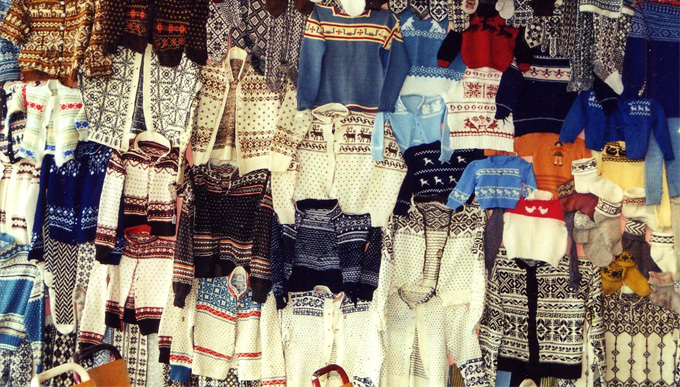 The sweaters being worn by most people there at Yulefest were not the traditional handknits like theses but rather the Dale of Norway machine knit ones – very colourful but I still don’t really like the feel or the weight of them. 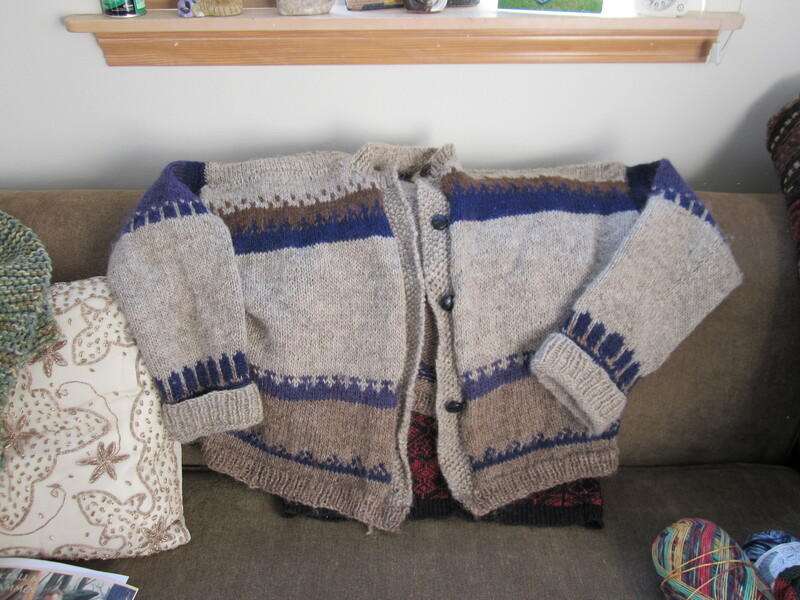 I did find some Icelandic sweaters that were handknit and I thought long and hard about buying an unusual one done in black and red and yellow. 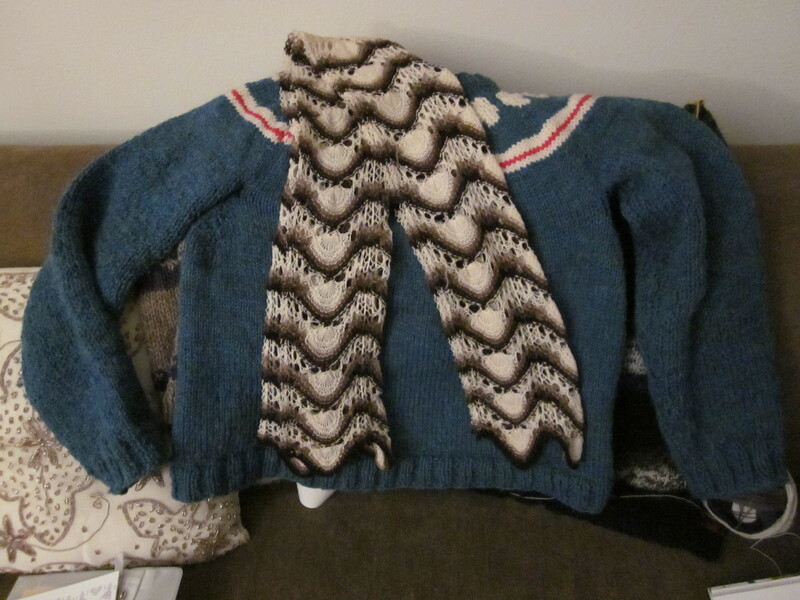 In the end I didn’t buy it, remembering that I already have an Icelandic sweater and I haven’t worn it all that much. Still, the one for sale was very unusual and striking – who knows, maybe I’ll see it again and I will succumb, rather than getting around to knitting another one myself. On Saturday it slowly dawned on me that yes, I too had a few colourful Scandinavian items but the cold snap had come so suddenly that I hadn’t made the transfer clothingwise. another one of my handknits which I designed myself. I knit it from the top down. 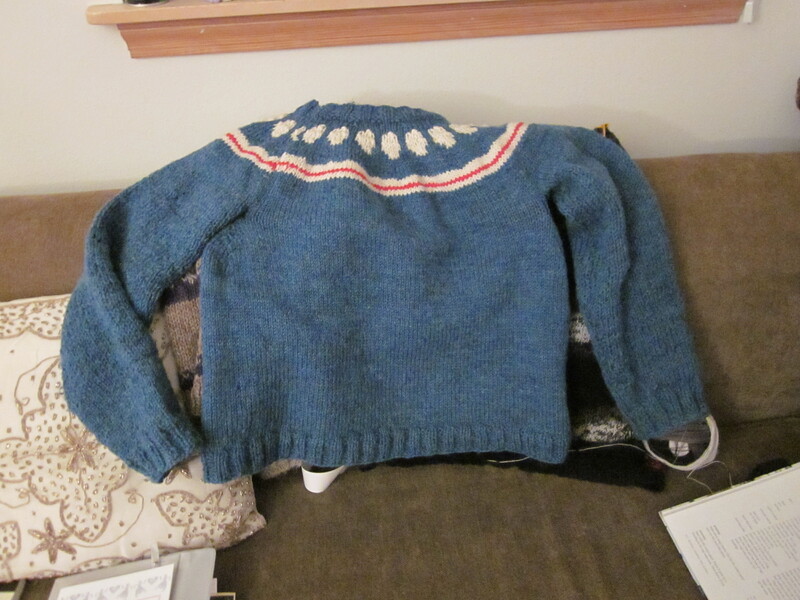 And I used an old Norwegian book published in 1965, Norwegian Knitting Designs. Now out of print. It had straight forward and simple instructions for how to go about knitting a sweater that way. I did wear this scarf and received many compliments. It is a Shetland knit which I purchased in a shop on the Royal Mile leading down from Edinburgh Castle. At the time I just wanted a sample of Shetland lace knitting. That was before my trip to Mull in 2004 when I met Liz Lovick and actually tried a bit of lace knitting myself. I think that shop on the Royal Mile is long gone now, sadly. They were in the process of closing when I was there. Alas, no more Shetland yarn to be purchased there. Incidentally, speaking of Mull and things Icelandic, a friend and I found several books of Lopi Icelandic designs when we rummaged on the lower shelves of the general store in Fionnphort where you get the ferry to Iona. Fionnphort is also where I found a few of the Jane Duncan My Friends paperbacks which I have mentioned elsewhere. A man supporting the R.N.L.I. had used paperbacks for sale in his garage and all proceeds went to that worthy cause. 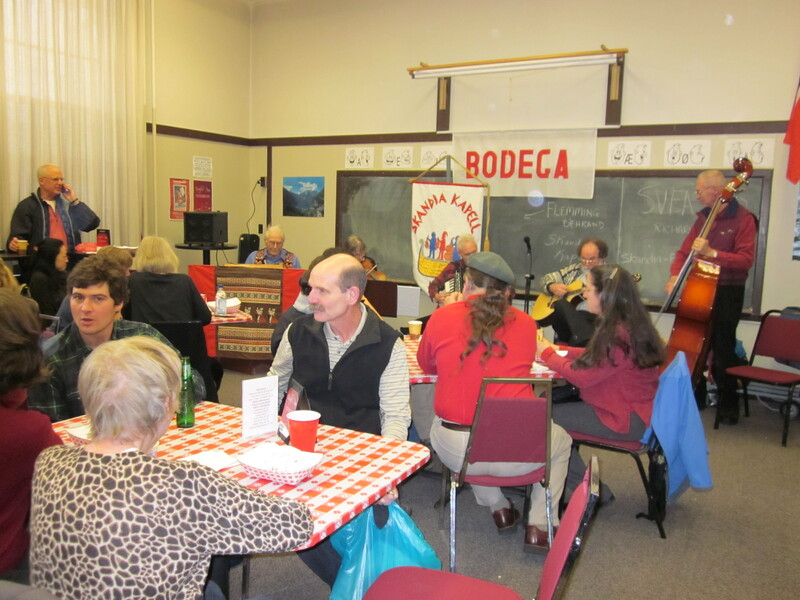 my Norwegian classroom was transformed into the Bodega. Good spiced wine available there! Just right for the next day when I came in after riding my bike in the cold (this was before the snow which came the next day). 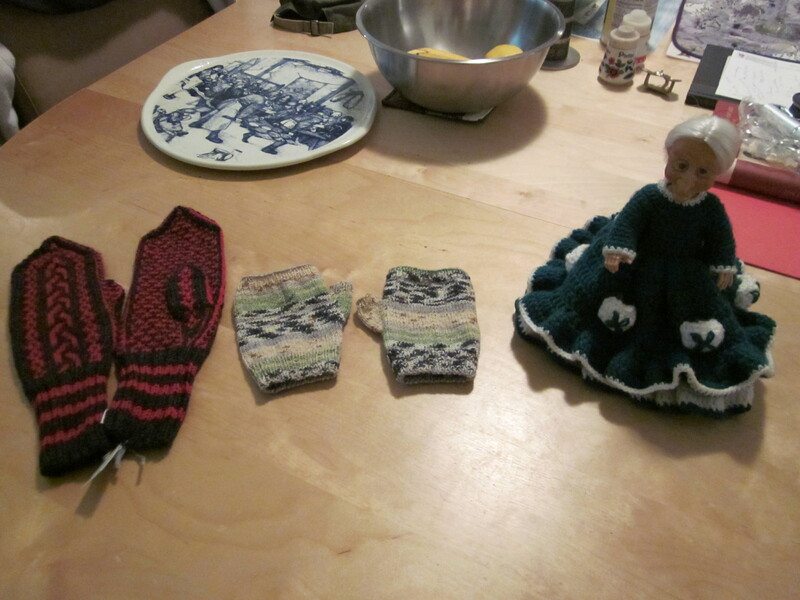 I couldn’t resist purchasing these items at the Yulefest – beautiful handknit mittens. Fingerless mittens. And a crochet lady – isn’t she a gem! I never thought the day would come when I would find such an item attractive. And a very deserving winner indeed. According to the Irish Times she has mastered a computer which she received from her family last Christmas. She uses the computer to surf the internet, send e-mails, talk to her 7 grandchildren and 2 great-grandchildren via Skype. She taught herself how to use the computer, she said, through her own “sense of discovery” and also took a class. I was told that knitting was mentioned on BBC Radio 4’s Today Programme one morning this passed week. I must have slept through that part of the programme. I went searching for it just now and couldn’t find it, but I did find a couple of interesting items and I “listened again”. One was broadcast in 2005 and was about the Craft Council’s Knit 2 Together Exhibition of Knitted Art. Two people from the Crafts Council were interviewed and were assigned the task of knitting a logo for the Today Programme. Here is the link. The next programme I found was a short clip showing Jim Naughtie trying on the vintage sweater showing the Today Logo. Have a look, and a listen here.